Spring salmon fishing in Sooke has slowed. There's still a few good ones to be found here and there, but in between are some slow patches. Otter Point in the afternoon seems to be the most commonly report bite time. Pinks and coho are still plentiful out in the tidelines. There are some really nice coho salmon into the teens ... a mix of wild and hatchery. Last weekend there were two events in Sooke's waters. The Consultants Invitational Derby was a great success, fun times for all involved. The Pink Salmon Festival continues to be super event for the kids....getting kids who don't have the opportunity to go fishing out on the water. It was an excellent event from start to finish, ran smoothly, and a 100 or so kids grinning ear to ear! Anyone with a boat is encouraged to come out in 2011, for the next pink salmon run. 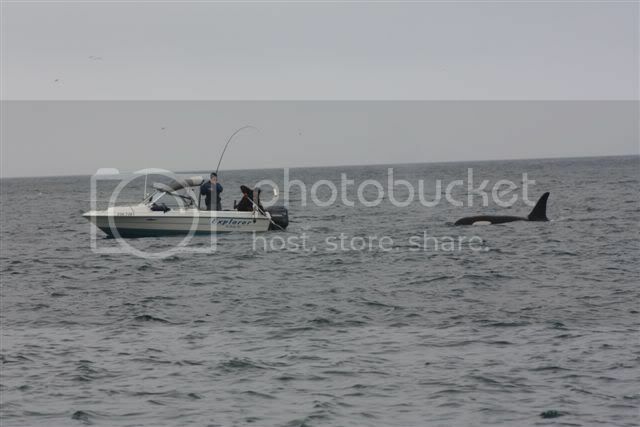 Here's some fishing excitement during the Consultants derby...photo taken by Glenn Votkin of Martech. The orca whale chased their salmon almost right into the boat. They landed the 15 pound spring, and then the orca hung around under their boat for a minute or so, rubbing alongside it. Yikes! All in all...there's adventures to be had, definitely worth getting out onto the water for a Sooke fishing adventure.